Be 1 of 6 lucky couples to win exclusive seats at the Italian Supper Club’s La Dolce Vita – Pop Up Restaurant table with CarmenTV at Backyard Vineyards on August 31, 2014! Winners will enjoy a three course Italian dinner, prepared by Chef Uli Larosa, paired with wines from Backyard Vineyards. Simply tell Carmen in a few sentences why you deserve to win in the entry form below. 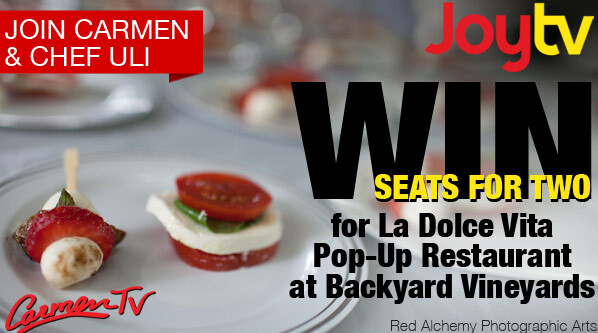 Two seats at La Dolce Vita – Pop Up Restaurant at Backyard Vineyards. Three course Italian Dinner including fresh hand made pasta, artisan breads and traditional Italian desserts. Contest closes at 11:59pm Friday August 22, 2014. 19 yrs and older please.